A year since the original diagnosis … it seems I have so much to say, especially lately, that I’ve been saying nothing at all. At least, blog wise. It’s been a rollercoaster. Funny, for all my adventurous Yo Ho spirit, I really really really don’t like rollercoasters. So the Ups in my life have rocked… the downs, not so much. The last couple of months have actually been the trickiest in the whole experience. But let’s start with a huge UP. Glancing through my blog posts, I am stunned that I didn’t find one announcing the birth of my newest granddaughter!! Oh, there are blog posts about the wee Emaline to be sure, but they are on my Gramanana blog, a private blog where I collect thoughts and wonders of these little gals in my life. She is a miracle baby, now 2 months old. We are all so blessed, and I am so grateful for the three little ones in my life who always make my heart melt and my smile smile, as they wash away the other life stuff that can make a person a bit crazy. There is magic in the births of each of my three granddaughters.. stories I do want to share, but keep forgetting to ask their mommies if they are okay with that. And THREE granddaughters… makes me think we ought to start a rock band or something. Best learn to play an instrument, my voice won’t hold up its end of the band. I’ve sat quietly as new medications play havoc with my hormones the last couple of months… and, well…. anyone here ever have severe PMS? Ya. Probably best not to write blog posts during the cranky days because it would be rude of me to yell at all of you over something inconsequential which you probably never did anyway. Even my own visualizations are a bit cranky at times. My paintings cranky too. I’ve not written about how going through the worst treatments was easier than the last couple of months. During chemo, a person has a strong, clear purpose: Get Through This Well. As I move forward and am physically stronger, (yes, delightedly! Even though still in treatment and despite the added bonus of hormonal craziness), I find myself all over the map on what’s next, on rebuilding my business, and yes, I am selling my home. Grateful for all the financial support I’ve had.. so very very grateful… and now, rather than battle debt that’s been building, I think selling is my best option. On the less cranky days (and they are lessening as I adjust to the treatments) I do remind myself not to be hard on myself … it’s okay to be wavering, wondering, processing the whole rollercoaster of the year. Given that I just had surgery yesterday as part 2 of reconstruction, and I’m sitting here with ice on my chest… yes, it’s okay to be wavering, wondering and processing this experience and to be uncertain about the direction I’m going from here. Actually this surgery is an UP… feels like a turning point in going forward. So inappropriate to mention on a blog how cute my perky little breasts are, so I won’t mention that. And despite all this wavering, I do know a wonderful wild adventure is due and have promised myself that in the not too distant future. In the wavering kind of way, I’m not sure what that will be yet, but it will be. ~smile~ And I do know I will put my energies towards what matters most. That’s part of the tricky part right now.. a lot of things matter most to me. I finished writing my book… a creative memoire of a 15 year period of my life. Some have called it a magical memoir. Although not a recognized genre yet, it seems like a good fit to me. Writing the book has been an ongoing saga in itself.. finishing it feels amazing. And scary, in a good way. Another round of edits.. and soon, I’ll take the next steps in getting published. It is somewhat hysterical that I did this final rewrite during chemo and cranky hormone treatments. Sentences seemed wayyyy too long, and were then shortened to wayyyyyy too short. Huge sections were taken out – too much for my mind to handle at the time?- and some will be going back in. But all in all, I pulled off pulling together a very strange book. Huzzah! More UPs… I’ve been downhill skiing a few times, and with the granddaughters there learning to ski, too, it’s been especially soul nurturing. Actually, now that I think of it, there’s been a lot of UPS. Walking most every day with dear friends. And loving leading the Muse Group Facilitator Training once again. So blessed to be connected to inspiring, quirky, intelligent, compassionate unique people in so many areas of my life. Sometimes, Janet, the more joy you fake, the more joy you make. Same for anything else you might fake. Nice one, Universe. Fake it, Act as if, Imagine… all tools that take things up a notch. Okay, so I thought this blog post would end up with cranky tendencies… but apparently, in the writing, I can find more UPS than downs. The rollercoaster above? 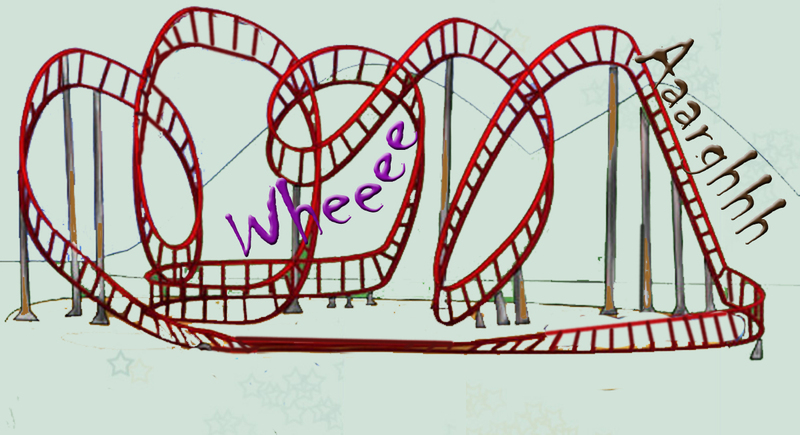 I draw random wild rollercoasters on paper, and mark the highs and the lows of a day, or a week, or a year. It’s a great way to recognize what really feeds your soul and what doesn’t, and find the way to spend time with the good stuff more often. Also a good way to notice what ‘not so good’ stuff can be let go of, and to remember the Ups will ease the ‘not so good stuff’ that can’t quite be let go of. Today, I’ll acknowledge myself with some kind of prize for noticing the UPS in this couple of months that has had anxiousness, tears, and crankiness. Russian parahe, I think. There’s some in my freezer…. Posted in Healthy Me - a Healing Adventure. Bookmark the permalink.